I’m a fan of rust. Not so much on the inside of a toilet or behind a drippy faucet, but a nice slab of rusted steel à la Richard Serra offers such a great combination of rich color and texture. Not surprising, then, that I really love this building by German studio Scheidt Kasprusch Architeckten. 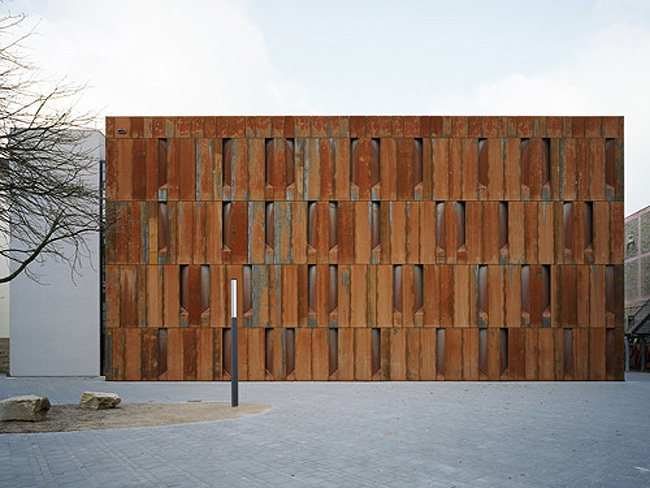 The four-story Haus der Essener Geschicte, in Essen, Germany, is clad in corten (weathered steel) which constantly alters and protects itself by corrosion. It demonstrates the change of time as well as alluding to the background of Essen. The building was built to house archives as an extension of the Luisesnschool which is used as a library and exhibition space.